At White’s Grocers our goal at the store is to support kids at our local schools and their favourite sporting and recreational activities to ensure they are spoilt for choice. We support AFL, soccer, cricket, netball, athletics and those community organisations that you don’t read about everyday. IGA Peregian Beach i is committed to assisting the Peregian Beach and surrounding communities. 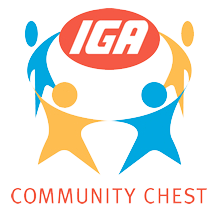 We provide support to a range of local not for profit organisations through direct donations, fundraising activities and the IGA Community Chest program. Every time you purchase a Community Chest product a portion of the sale goes towards supporting organisations, charities and community groups local to our store. If you are part of a not for profit charity or community organisation that’s local to our store and would like to know more, please contact us through our online form and we’ll be in touch.